After installing the Module for Silverlight Testing, you will be able to test scenarios containing SOAP-MSBIN and MSBIN requests. WAPT will parse such requests and represent the data in the form of XML. 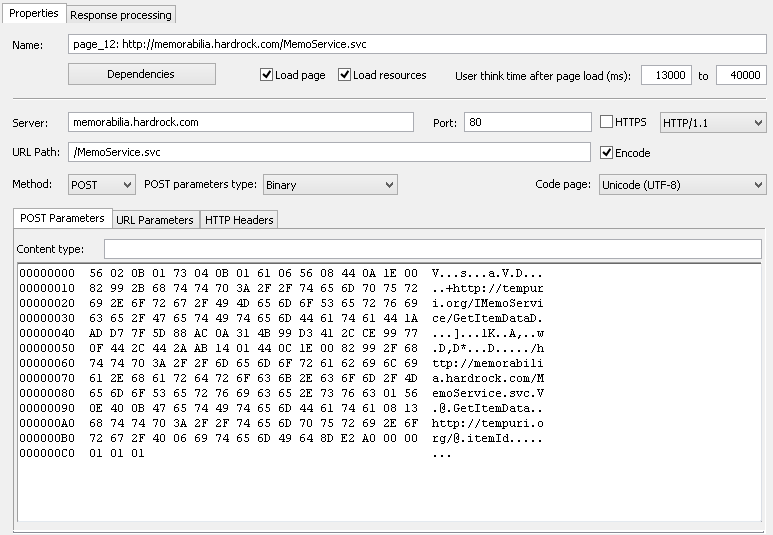 Here you can see the XML code of parsed request. It is accessible for editing. You can use variables defined in one of the previous requests in the XML code. To insert a variable, enter the $ sign and you will see a prompt with the list of available variables. Select a desired variable in the list to insert it in the XML code. Note that you cannot use WAPT functions in the XML code directly. First, you should define a variable which is calculated as a result of the necessary function, and then insert that variable in the XML code. On this program view you can analyze the recorded HTTP request and server response that was received during the recording process. In case the Module for Silverlight Testing is installed on your system, you will see the parsed SOAP-MSBIN request and server response. If the module is not installed, such requests and responses will be unparsed. 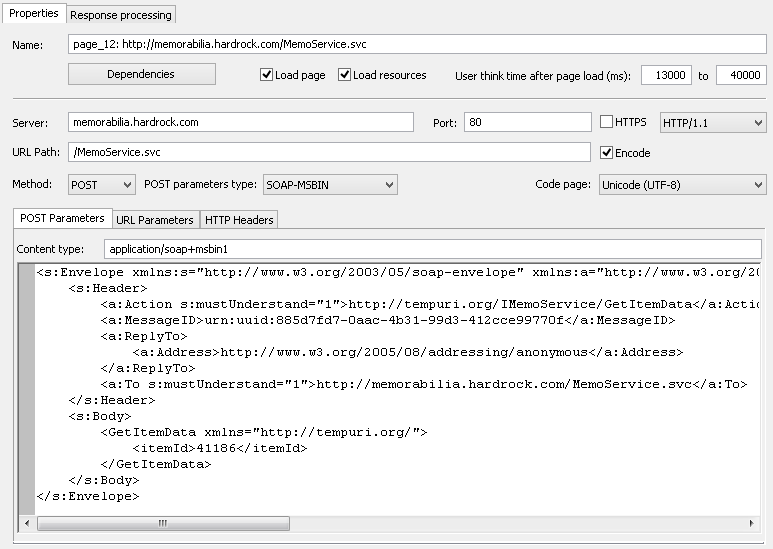 Request Header: Here you can see the HTTP header of parsed request. Request Body: The body of parsed request is shown on this tab. Response Header: Here you can see the HTTP header of server response. 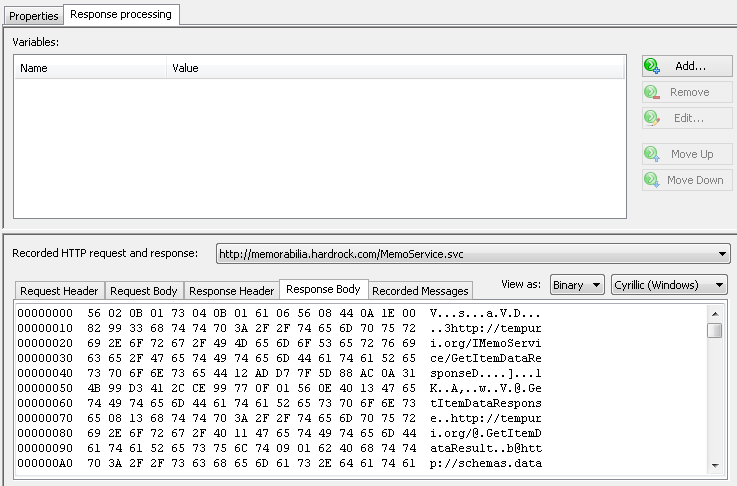 Response Body: The body of server response is displayed on this tab. Note. In the unregistered version of the Module for Silverlight Testing, the maximum number of virtual users for tests containing SOAP-MSBIN and MSBIN requests is limited to 20. This limitation is removed when you register the product. If the module is not installed and you record requests containing the Silverlight data, then at the end of recording process (when you click the Stop Rec button) you will receive a warning message. It notifies you that some of requests contain the Silverlight data which was not parsed, and suggests opening a web page where you can download the Module for Silverlight Testing. Silverlight data in recorded requests and server responses will be recognized as binary data which is not accessible for editing.